Mary Trivoli answered the call in January 2010 to assist with sorting donations for the residents of Good Shepherd Center. Soon after, she signed on to be a member of our Auxiliary. Over the past three years she has continued to volunteer on a weekly basis; sorting, organizing and distributing clothing to the residents that come to us for interview clothing, preparing move out packages and providing residents with daily necessities. She is always ready to lend a hand and has served as a volunteer for special events, volunteer orientations, fund-raisers, mailings, and even clean up days. 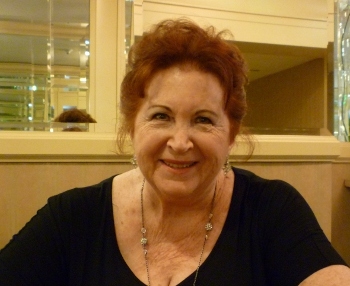 Mary is a native of Los Angeles, but has traveled quite extensively to Europe, Hawaii, Canada and Mexico. She worked primarily in the entertainment industry at CBS television, Turner Film Library and Universal Studios. Mary loves to sing and has been a choir member at St. Agatha’s Catholic Church and Della Reese’s Church, Understanding Principles for Better Living. Most recently, karaoke has become her passion! Please ask to see our donation center when visiting the Historic House to see what a fabulous job Mary has done organizing your donations! You can sign up to participate in one of our Donation Give Away days to see what an impact this has made on the services we provide for our residents. We honor Mary, as a valuable member of our Development family. BBeverly Archer was one of the newest members of the Auxiliary when she was asked to serve on the volunteer and membership committee. Serious about her new position, she made a point of introducing herself to the staff at GSC and asking how she could be of assistance. She was so impressed when she met Sister Rosaline that she began volunteering on the outreach team almost immediately. Not only was Beverly touched by Sister Rosaline’s cheer and optimism, she was impressed by her “knowledge of what happens on the street.” Beverly said that the first time she accompanied Sister Rosaline, they came upon a woman with a suitcase near Union Station. Beverly assumed this woman was waiting to take the train or bus but Sister Rosaline instinctively knew that it wasn’t the case and was determined to speak to her. They learned that the woman had been homeless less than 48 hours and was very frightened; she was grateful for the food they gave her and for the referral to the shelter. Beverly knew that she had found her niche; she too wanted to be in direct contact with those being served and since then has been a regular assistant to Sister Rosaline on the outreach van. Beverly is also a volunteer cook at the shelter, admitting that it is both selfish and fun. She loves to cook for others and does not find as much pleasure in cooking just for herself. She cooks for the ladies a few times a month and gets creative with whichever ingredients are available. According to Beverly, she sometimes cooks strange things, like the time she was presented with five ducks, and had never cooked a duck before. She simply takes a leap of faith on what the outcome will be, and the women at Languille agree that it’s always tasty! Away from GSC Beverly is a sculptor and loves to travel. She is best known for her clay piece The Warren. Thank you Beverly for your dedication to the Auxiliary and to the residents of Good Shepherd Center. We applaud you! Life Coach Lauren Graham, (far left) herself once homeless with two small children, had a calling to share her passion with the women living at Good Shepherd Center. Her volunteer efforts started with individual coaching sessions, including only a couple of women. Seeing the great need and wanting to reach out to more women, Lauren suggested group coaching. 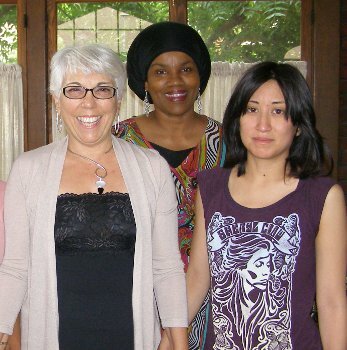 In June, 2012, she facilitated a 4-week group coaching program with 8 women, which extended into a 12-week program because the women found such great value in the coaching, the concepts and tools presented. During that time six women found jobs or moved into their own apartments, and one completed the culinary arts training program at The Village Kitchen. Equipped with new ways of thinking, beliefs that support their growth and success, supportive habits and higher expectations, the women have adopted stronger goals and are more positive about their future. Maria Thomas, one of the group coaching participants said to Lauren: “You always know just what to say and how to say it… I really admire your work, and all that you do. It’s your positive energy that sets the mood of the sessions and gives us the motivation we need to soar! I grasp every opportunity to put into action the tools you provide because it works. I am a better me because of you.”ange someone’s life! Haig “Hike” Mkhoian has a vision for a global awakening and does his part to set an example of how it is to come about. By profession, Hike is an arts curriculum development coordinator and a teacher at a private preschool in Studio City. When he is not educating young minds, he manages his own 501(c)3 nonprofit organization called Hike It Up!, which he founded in 2009. The mission of Hike It Up! is to bring communities and families together by producing progressive events and fundraisers that involve community based activities and improvement projects that serve youth, family, individual, environmental, and school-based programs. Hike has made a great impact on the Los Angeles community. He teaches by being a role model and coordinated a volunteer day to clean McArthur Park. He said that he realized when the project began that it would probably be filled with trash the following day but that for one day it would be clean and so it was worth the effort. When he first started his non-profit, Hike had a vision of one thousand people each giving $5.00, and with that they could renovate a shelter. More realistically, he found thirty people willing to give $5.00 each and said they still managed to do a lot. He has a vision for Global Awakening in which everyone is aware of what is needed and each one does a little bit to make it happen. Hike’s charisma, positive attitude and outgoing personality have influenced others to volunteer and give where they can. Hike started volunteering with GSC in April of 2011 and in May he and his group of volunteers hosted a Mother’s Day luncheon for all the women. 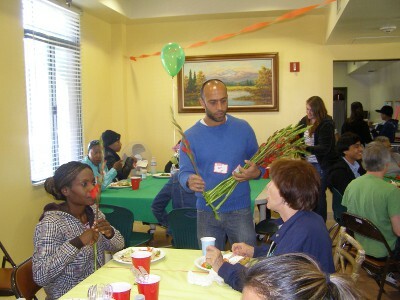 He hosted a Valentine party, an Easter party and cooked breakfast at our emergency shelter. Hike spent the summer in Italy but returned a few days before the Labor Day weekend to provide a barbecue for the women living at Languille Emergency Shelter. He will return later this month to cook breakfast for them. He gives credit to the many volunteers he recruits for these events. One of the volunteers that Hike recruited was afraid of going to a shelter but after volunteering at GSC, realized the joy she received from being of service. Since establishing this partnership with GSC, Hike devotes an average of 15 volunteer hours per month, both onsite and offsite, to educate the community about Good Shepherd Center, and plan events to benefit the women and children. Not only has GSC gained several new volunteers as a result of his efforts, but we have found a new friend in Hike.